No matter what a pet shop owner or dog trainer might say, a crate is just a cage, and putting dogs in crates is just a way to ignore and warehouse them until the guardian finally gets around to making time for them. Crating is a popular because it is convenient. But this inappropriate practice deprives dogs of the opportunity to engage in some of the most basic activities, such as walking around, stretching out to relax, and looking out a window. Obviously, it prevents them from relieving themselves or indicating the need to relieve themselves as well. Crating began as a way for people who participate in dog shows to keep their dogs clean, but they did not take into account their dogs’ social, physical, and psychological needs. Dogs are highly social pack animals who abhor isolation and crave and deserve companionship, praise, and exercise. Forcing dogs to spend extended periods of time confined and isolated simply to accommodate their guardians’ schedules is unacceptable. Crate training does not speed up the housebreaking process. Regardless of the training method, puppies do not develop full bladder control until they are about 6 months old. It is counterproductive to crate young puppies in the hope that they will “hold it.” They are physically incapable of doing so and will be forced to urinate in their crates after experiencing great discomfort while trying not to soil their beds. Puppies who repeatedly soil their crates often lose the urge to keep their crates clean, which in turn prolongs and complicates the housebreaking process. 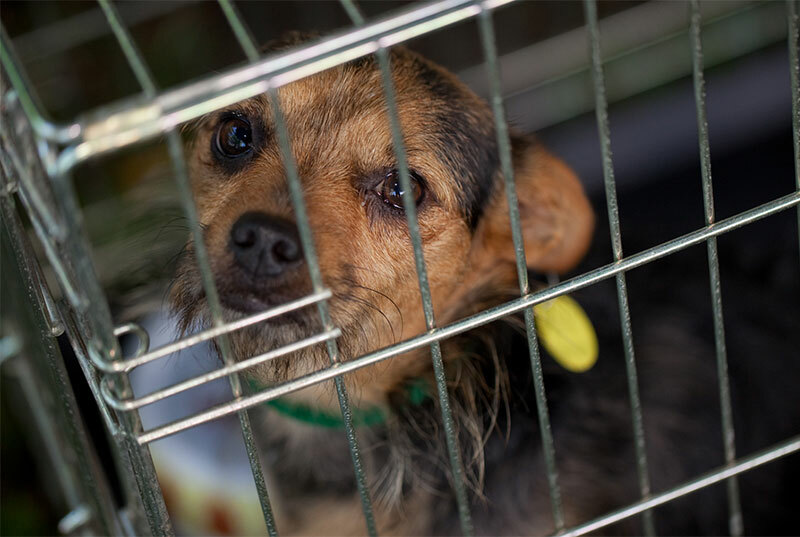 Puppies who are born and raised in crate-like structures in pet shops and puppy mills can experience severe anxiety and develop fearful or destructive behavior if they are confined to crates. They may even injure themselves while trying to bite or scratch their way out. Studies have shown that long-term confinement is detrimental to the physical and psychological well-being of animals. Animals caged for extended periods can develop eating disorders and anti-social and/or aggressive behaviors, or they can become withdrawn, hyperactive, or severely depressed. TFPF does not oppose keeping a dog in small area if it is in the dog’s best interests (e.g., when cage rest is ordered by a veterinarian or when confinement will keep the dog safe during travel). In such cases, guardians should always take steps to ensure that dogs are provided with bedding and the opportunity to relieve themselves and that they are given access to water, fresh air, food, and other basic requirements. For people whose work schedules force them to leave their canine companions at home during the day, there are numerous humane alternatives to crating. TFPF supports humane, interactive dog training, which promotes and teaches guardians effective ways to communicate with their animal companions. Committed caretakers who successfully complete training and continuously practice with their dogs have no excuse for imprisoning their well-behaved companions while they are away. For those who cannot make it home during the day, TFPF recommends hiring a reputable pet service or soliciting a reliable person, perhaps a neighbor, to take dogs out for midday walks. A “doggie door” that provides access to a secure, fenced yard gives dogs a way to relieve themselves and can prevent boredom. Having an animal friend can also alleviate boredom and loneliness in dogs. Click here for more tips on how to help keep your animal companion healthy and happy.